Before Christmas 1991 (or, like my beloved show The Goldbergs says, “199-something”), I was not a “gamer”. I liked video games but I wasn’t yet lost in the digital world of games. Before that fateful Christmas, I was more interested in running around outside pretending I had magic powers or was a superhero and playing with my action figures. Let’s be honest, it was more of the action figures. I was creating my own worlds with them. I was also falling into the habit of writing stories. If memory serves, around 11 or 12 was the start of my career as a horror writer. It as also a time of my brother and I fighting more and more. Growing more and more distant. Neither of us knowing that the other was fighting the same inner battle. Then Christmas. Christmas when your parents are divorced means something different than if your family isn’t broken. It’s always tinged with a hint of sadness. But, occasionally anyway, it’s also a bit of overcompensation. Guilty parents making up for the misery they’ve inflicted. In our case, maybe we weren’t miserable. I don’t remember being all that destroyed over the situation. It was just something that…was. Our present opening was wrapping up with just a few left to go. One being a conspicuously larger box than the others. It was for sure that one gift that you knew was something special, not necessarily because of its size but more so because you were made to wait to open it last. So there it was. That special gift. Eyes widened, we both reached for it, each of us believing it was ours, and it was ours. Both of ours. One of those double name gifts that kids have to share. We hate that, right? We ripped the paper away and revealed that holy grail. A brand new Super Nintendo Entertainment System…but that wasn’t all. I don’t know if my brother asked for it or my mom just saw it and bought it so we had another game to play with the system, but there it was. Wrapped up with the system just sliding around under the paper and knocked to the side when we ripped that paper away, was Final Fantasy II. I’d never played an RPG before. Not even sure I knew what they were at that point but once that system was connected and that game was turned on…that was it. For the first time in I don’t remember how long my brother and I shared something without fighting over it. It was entirely new to both of us and it opened my eyes to a completely new world. Final Fantasy II was the hook that turned me into a gamer and it brought my brother and I closer than we had ever been. To this day we play games together, we talk about games together, and we bond even further over them. None of that would have been without Final Fantasy II. We played that game together. Neither of us fighting over who got the controller. Each of us had our own save file but we both watched the other playing. Each of us experiencing the grand story together twice as we completed it. From the opening scroll, Cecil’s transformation, Kane’s betrayal, Golbez, the moon, the grief of Palom’s and Porom’s sacrifice, all if it we experienced together and it profoundly changed my outlook on gaming and my relationship with my brother. It gave us something to reconnect over. We still fought, pretty badly, but we always had games. We still do only now we can play them together a thousand miles apart. 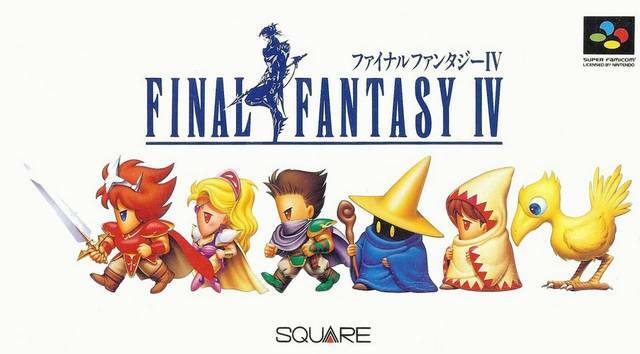 There will always be Final Fantasy II though. The game that opened my eyes to the beauty and wonder of video games. The game that fundamentally changed a fractured sibling relationship and a game that even taught me tons about character and story and falling in love with a world and losing yourself in it. That is the game that will never leave me. One to be born from a dragon hoisting the light and the dark arises high up in the sky to the still land. Veiling the moon with the light of eternity, it brings another promise to Mother Earth with a bounty and mercy. Garon Cockrell is a screenwriter and the founder of Pop Culture Beast. Follow him on Twitter. Previous PostGuest Post: The Case of the Dead BatteriesNext PostBack to the grind!